VOTE COUNTING in the 2017 elections to Shetland Islands Council is underway at Clickimin Leisure Complex. 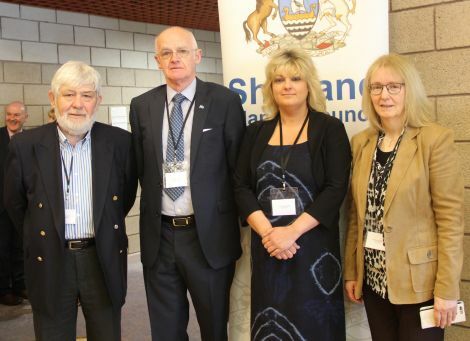 With the Shetland South ward already decided (all three candidates – Allison Duncan, Robbie McGregor and George Smith – will be councillors), it is expected the other six wards will be declared by around lunchtime. “I think we all fought at the same level. We were out there and we were on the doorsteps. We met a lot of people, and it went well. Cecil Smith, re-elected with the most first preference votes in the ward: “I’m quite happy to be re-elected. I would thank the community in Lerwick South including Gulberwick and Brindister for supporting me. Amanda Westlake: “I’m absolutely delighted that the electorate has voted for me and I promise that I won’t let them down. I’ll get on with my job on Monday morning. Peter Campbell. “I’m pleased to be back and to have been trusted with another five years. I’m looking forward to serving the Lerwick South ward. Across in Lerwick North, convener Malcolm Bell: “I’m delighted to be elected. It’s been a long, hard campaign. The three active candidates in Lerwick North have worked really hard, and I think people have appreciated that, despite the fact a number of people said there wasn’t a candidate, because the fourth candidate didn’t campaign. The three campaigning candidates still got out there and got speaking to people, and I think that’s gone down well. John Fraser: “I’m absolutely delighted. It’s been a difficult few weeks, but it’s been a very enjoyable few weeks. In reality the hard work starts now. I don’t underestimate the magnitude of the task at hand. I give my absolute assurance that I will give it my all. 1150: – That’s all the wards declared now. The headline news will be SIC leader Gary Robinson losing his seat, though that outcome had been widely predicted. The 2017-2022 council will be a younger one. The gender balance has improved, albeit only slightly, to feature five women (up from three) and 17 men. There are 12 councillors returning, albeit one (Steven Coutts) in a different ward, and 10 new faces. Overall turnout was 49.1 per cent. 1133: – No surprises in Lerwick North, where the Tories’ “paper candidate” Thomas Williamson – who used the campaign to urge people not to vote for him! – won only 26 first preference votes. Victorious were Malcolm Bell (715 first preference votes), Stephen Leask (130) and John Fraser (124). And the turnout was lower at 42.8 per cent. 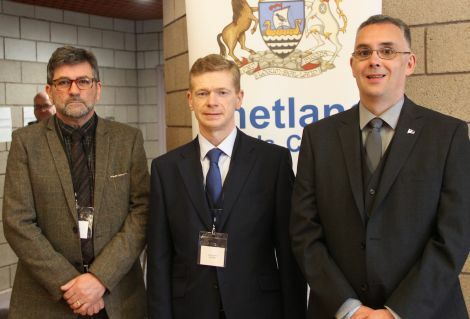 Across town in Lerwick South, three councillors have renewed their mandates: Cecil Smith, Peter Campbell and Amanda Westlake. The new face in the ward is Beatrice Wishart, who was second only to Smith with 394 first preference votes. Smith won 429, while Campbell won 299 and Westlake won 190 – narrowly ahead of Frankie Valente (180 votes) who is the only candidate to miss out. Turnout was only 43.7 per cent. 1110: – Just the two metropolitan wards, Lerwick North and Lerwick South, still to declare at the Clickimin. 1044: – A declaration in the North Isles ward. Successful candidates are Alec Priest, Duncan Simpson and Ryan Thomson. Turnout was 63.7 per cent. Whalsay man Simpson polled the most fist prefrence votes with 453, while Ryan Thomson won 372 and Alec Priest 327. 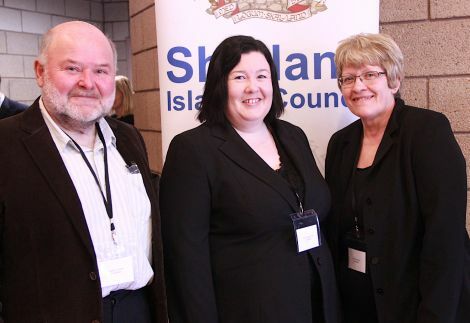 As expected, in Shetland North, Alastair Cooper, Emma MacDonlad and Andrea Manson are the successful trio. Manson took a convincing 509 first preference votes, Cooper was second with 395 votes and MacDonald won 240. The Tories’ “paper candidate” Isobel Johnson was a distant fourth with 48 votes. Turnout there was 48.1 per cent. 1028: – Ballot papers for Shetland North and the North Isles are now being counted. In the North Mainland, it is expected that incumbents Alastair Cooper and Andrea Manson will be joined by Emma Macdonald, with the Tories’ “paper candidate” Isobel Johnson the most likely to miss out. The North Isles, probably the most competitive ward after the West Side, will see three of the five candidates elected. None is currently a councillor, and it must be one of the most youthful contests the local authority has seen. Candidates are Lynsay Cunningham, Cecil Hughson, Alec Priest, Duncan Simpson and Ryan Thomson. Steven Coutts, who ruptured his achilles and had to campaign with his leg in plaster: “I’m glad that the Westside has their faith in me for the next five years. I’m keen to make sure I can deliver. 1015: – Davie Sandison won a commanding 320 first preference votes in the Shetland Central ward. He said it was “fine to get out there and test the temperature with the folk in the ward”, though he was disappointed by a “quite low” turnout of 40.9 per cent. Mark Burgess also did well, polling 260 first preference votes, while the outspoken Ian Scott won 191 and finally wins election to the SIC after many years of trying. 1008: – So, despite building up a strong profile outwith the islands through the award-winning Our Islands Our Future campaign for islands autonomy, Gary Robinson has failed to build up enough political support back home. The issue of Aith school, where he was deemed not to have supported the secondary department, appears to have cost him the seat. It’s a resounding victory for Theo Smith, who secured some 521 first preference votes to earn himself a second term as councillor. A good showing from Catherine Hughson, too, who polled 194 first preference votes to win her seat. 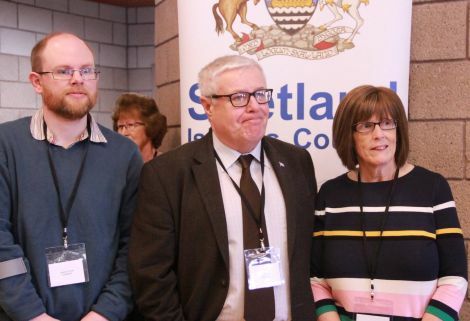 Steven Coutts, having shifted from his native North Isles to the West Side (he now lives in Weisdale), will be delighted to have won the support of a different community, and one where he is perhaps less well-known. His campaign was also hampered by having his leg in plaster. 0952: – Returning officer Jan Riise takes to the podium to announce the first results. In the Shetland West ward, SIC leader Gary Robinson has lost out. The three elected councillors are Steven Coutts, Catherine Hughson and Theo Smith. 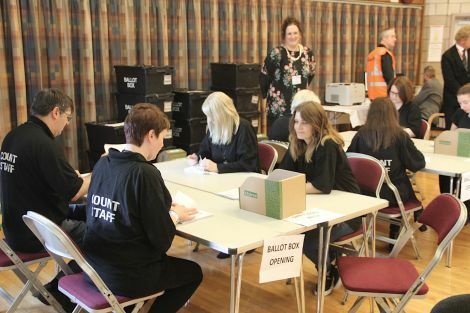 Turnout was just over 60 per cent. There are no places either for Debra Nicolson or renowned keyboard warrior Ian Tinkler, who finished sixth. 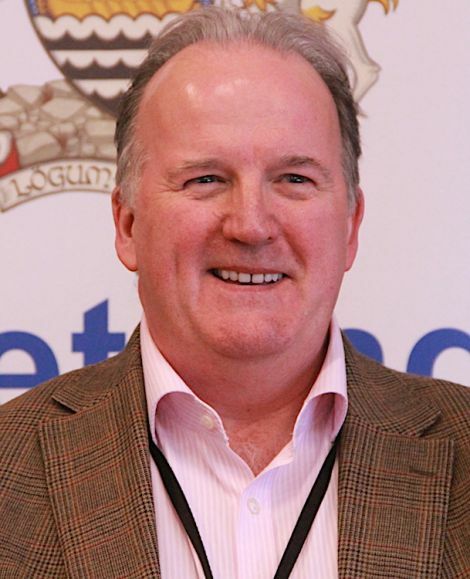 On a lower turnout of 40 per cent in Shetland Central, Ian Scott has finally won election after many attempts. Davie Sandison and Mark Burgess have both been re-elected. That means Julie Buchan and Brian Nugent miss out. 0947: – We’re about to get the results for Shetland Central and Shetland West. 0935: – There has been some speculation that council leader Gary Robinson’s place in the Shetland West ward could be under threat. That constituency, along with Shetland Central, will be declared within the next half hour. Robinson says he is “taking nothing for granted” in the election in what is one of the most competitive wards. 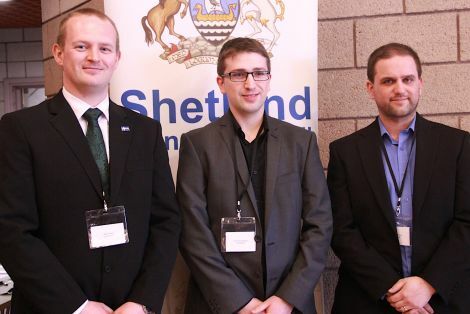 He is one of six candidates in the Shetland West region, which offers just three seats.